Every summer there is a Milling Frolic in the community where I grew up. It is a celebration of history, of Gaelic singing, of music and dancing and an occasion for reunions and remembering. I always contribute stitching to their fancy booth usually aprons or potholders or other small items. When I asked my sister what they needed she hesitated a moment then said "we don't have anything big for tickets. How about a quilt?" Oh my !! Time was short .... A machine quilted lap quilt would have to do. No time for hand quilting. My machine quilting needs a lot of polishing. My goal this winter will be to improve this skill. 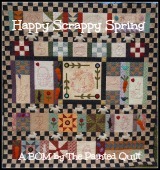 I love the look of a quilt blowing in the breeze. That's beautiful, and the outdoor pictures are lovely. I think it is so good of you to do a quilt. That is a lot of time and money to donate, so that means you donate with lots of love. Love your quilt and the photo of it blowing in the wind. P.S. I love small towns and small town gatherings. Terrific addition to the booth. It's so very pretty! I'm sure your quilting will be just fine. People will be so taken with the overall beauty of the quilt, they won't see a mistitch or two. Beautiful quilt with a beautiful view!